So I adore the Ghibli movies, and since I also adore the original Arsène Lupin it can hardly be a surprise I love the Castle of Cagliostro, the collision of his grandson Lupin III and Hayao Miyazaki. Brian and I watched it again the other day, and it’s definitely one of my favorites, full of action and Lupin getting the better of people. 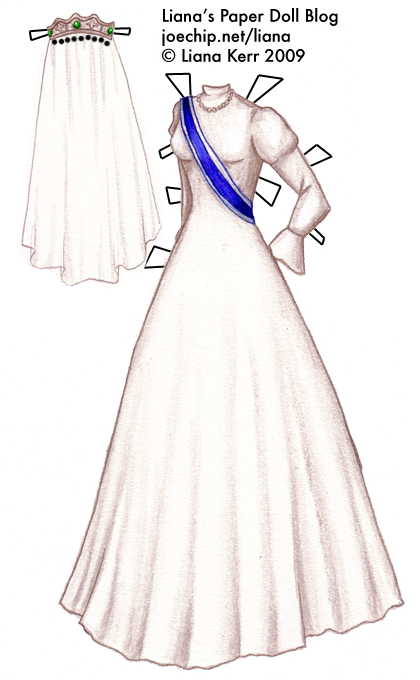 Clarisse here gets two wedding dresses, and I opted for the crown of the first and the dress of the second, because I can’t pull off the thing she wears that covers all her hair unless my paperdoll fans are willing to mutilate their copies of Iris and Sylvia to make it fit. Oh, great dress by the way, as always, haha! Hi I think that this is a wonderful dress. I love the crown and the blue ribbon. Thanks :) Yeah, she loses the blue ribbon in the ensuing chase scenes, but I thought it was a nice touch for her gown.